JRFComputing has been dealing with many forms of databases since the advent of PC technology. Many database systems have been developed using the advanced technology of the time - McNos - Pick - PickBlue - D3 - OA and all forms of SQL. All web work and and current development for all organisations takes place in either MySQL 5.5 or MariaDB using ODBC connections. Development of all applications is done using PowerBuilder 12.5 for stand alone applications with any variety of SQL based system. All web application work is done via the Joomla and front end and PHP. Hosted MySQL databases for website based applications or MariaDB for NAS based. 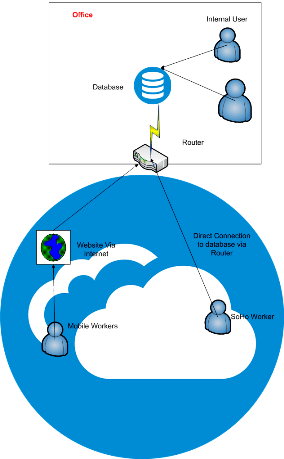 The simplest current database configuration, local PC's/Workstaions accessing a local networked server, of course there are many ways to access the data via remote desktop working etc.. but essentially the database is housed within it's own secure network environment, either on a Windows Server, NAS Device or other Database platform. Webdata access allows connections from many different sources, 98% of all websites are database driven (including this one) many hits can add pressure to the database to perform. A different skill set to adapt a database to be web orientated is required, security is also a major factor, a system on the web is potentially available for the whole world to have access to and althought not normally apparent Web servers are under constant bombardment from unscrupulous hackers trying to gain entry. 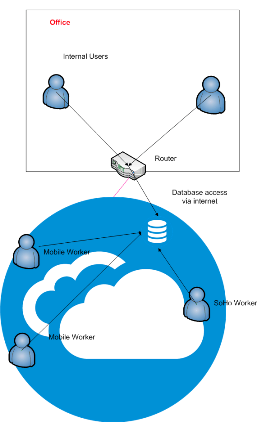 The best of both worlds, an internal database but with direct access for all local network clients, Web access from externally held website, plus direct access to the database from outside SoHo workers. For examples of all three types of database connection use the contact form from the Contact Us page to request a demonstration.